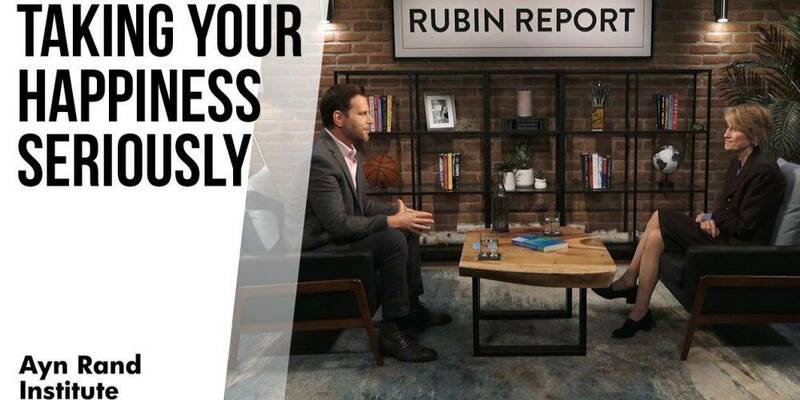 In the latest in a series of interviews produced in collaboration with ARI, Dave Rubin sits down with ARI board member Tara Smith, professor of philosophy at the University of Texas at Austin, to discuss what it means to really take your happiness seriously. These days, we have access to a plethora of information and advice on how to achieve a happy life: self-help books, life hacks, and happiness coaches are just a few of the ways in which people seek this advice. But a crucial question often remains unanswered: What is happiness? Ayn Rand defined the concept by saying that “happiness is that state of consciousness which proceeds from the achievement of one’s values.” In this insightful interview, Dr. Smith, whose thought is informed by Rand’s perspective, fleshes out and concretizes the meaning of this definition, and provides us with a refreshing alternative to life hacks and happiness coaches: she argues that the key to a happy life is having the right philosophical ideas. The idea that philosophy has powerful practical applications to everyday life is not a viewpoint we usually hear. Dr. Smith explains that having the right ideas is the basis of what we need to be happy, and that much of the unhappiness that people experience comes from working from philosophical starting points that actively get in the way of living a happy life. The idea that philosophy has powerful practical applications to everyday life is not a viewpoint we usually hear. For instance, we often hear that young people are supposed to pursue careers that will allow them to “give back” to society, for example, joining the Peace Corps after graduation. Is this really what we should do? Should we make our decisions based on others, or should we think of ourselves? Part of taking our happiness seriously means grappling with these questions. And, Dr. Smith argues, answering these questions means trying to develop the right philosophical ideas by thinking for yourself. She says that, ultimately, the right idea is that you need to determine what is good for you — which really means you need to be selfish about it. Can selfish people be team players? Are some people more easily disposed to be happy? Can religious people hold those beliefs and still be truly happy? In her conversation with Rubin, Dr. Smith comes across as the embodiment of the subject she is talking about: a happy, fulfilled person, who has applied the right philosophical ideas to her own life. Watch this delightful interview to learn about this unique viewpoint — and watch until the end to hear Dr. Smith’s answer to a perennial question about Ayn Rand’s ethics: Can helping others fit into the selfish pursuit of one’s own happiness? Her answer may surprise you. Audio podcasts are available on iTunes and Stitcher. What Ayn Rand’s philosophy teaches you is to be ambitious about your life. Make the most of the one shot you have at life. Learn how to achieve your own happiness. Then live every minute. So argues Yaron Brook in. . .